The building sector in India is rapidly emerging as a global center for green building construction. The World Green Building Trends 2016 report suggests that environmental regulations, combined with the desire to create healthier neighborhoods and to “do the right thing,” are driving this growth. The greatest growth is anticipated in new high-rise residential construction, mixed-use development and commercial building. Among the key benefits of this green building boom is the degree to which it can ensure healthy indoor air to millions of India’s people. This promises to be more important than ever in coming years, in light of rising air quality concerns. One of the hallmarks of LEED is its Low-emitting Materials credit for materials meeting strict indoor environmental quality (IEQ) standards. This credit is a key component of the rating system’s strategy for improving the health, well-being and productivity of building occupants. Studies have repeatedly documented the lower concentrations of key indoor pollutants such as particulates, nitrogen dioxide, volatile organic compounds (VOCs) and allergens in green buildings, compared to conventional buildings. 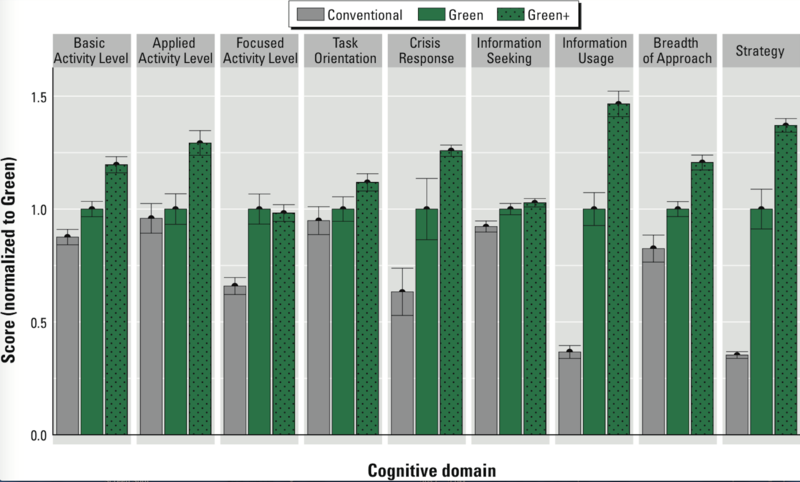 In 2016, a new report published by three leading U.S. universities demonstrated that occupants of green buildings function at a higher level of cognitive ability than others. The LEED Low-emitting Materials credit applies to a wide range of building products—interior paints and coatings applied on-site, interior adhesives and sealants applied on-site, flooring, composite wood, ceilings, walls, thermal and acoustic insulation. It also applies to the commercial and residential furnishings that fill these spaces. For health care and school projects, the credit applies to exterior applied products, too. For most products, the Low-emitting Materials credit applies to VOC emission levels, determined through laboratory testing. VOCs are carbon-containing chemicals that readily become vaporous or gaseous. They are typically released as a result of combustion or from solvents, and in some cases, are also regulated as hazardous air pollutants. This focus on emissions is intended to protect building occupants. An exception is wet applied materials—paints, coatings, adhesives and sealants—which must comply not only with VOC emission limits, but with content limits as well. This requirement is geared toward protecting material installers and incentivizing the reduction of toxic material ingredients in the building product supply chain. To meet LEED v4 standards, VOC content levels must not exceed relevant regulatory requirements set by such agencies as the California Air Resources Board, South Coast Air Quality Management District, European Decopaint Directive (2004/42/EC), the Canadian VOC Concentration Limits for Architectural Coatings and the Hong Kong Air Pollution Control (VOC) Regulation. Finally, manufacturers of ceiling, wall, thermal and acoustic installation products are also required to submit confirmation of no added formaldehyde. Likewise, batt insulation products for health care and school buildings may not contain any added formaldehyde, including urea formaldehyde, phenol formaldehyde or urea-extended phenol formaldehyde. There remain challenges, ranging from access to qualified laboratories to difficulties acquiring desired component materials. However, thanks to the convergence of several factors, including increased awareness of climate change and a deepening commitment to reducing pollution in cities and supporting the health of its residents, the green building sector is working to tackle these challenges step by step. Image credit: Environmental Health Perspectives, DOI:10.1289/ehp.1510037. Occupants in the green building simulation outperformed occupants in convention building simulation in all nine categories. Performance levels were even higher (Green+) when the rate of outdoor air ventilation was increased.